On November 29th Harlequin’s Gardens will Re-Open for Holiday Gift sales, after having been closed for November. Last year we inaugurated our Holiday Gift Market, featuring unique and exceptional goods crafted by local artisans, delicious local artisan foods, and sustainable, innovative and practical goods for home and garden. Many of you told us that it was your best shopping experience of the holiday season, that you appreciate our focus on locally-made and responsible products, and that you found outstanding, affordable presents at Harlequin’s for just about everyone on your list. This year most of the artisans and products are back, and we have added more than 20 new products and at least 11 new artisans and producers, including Mikl! We have many choices of everything from stocking-stuffers to necessary luxuries. And every day of our Holiday Market offers a chance to escape from the repetitive mass-market Christmas music we’re bombarded with everywhere else. You will especially enjoy our Open House, where we will again present exquisite live music from some of our very best local talent. Please share this invitation with friends and family who haven’t discovered us yet! Each day we are open in December, anyone who comes to the nursery and makes a purchase will be entered in our DAILY DRAWING for a $15 GIFT CERTIFICATE! You do not have to be present for the drawing at the end of the day to win – we will call the winners. and present it when you make a purchase during our Holiday Market. We have arranged our list of products in categories so you can more easily locate the kinds of items you’re looking for. Look for the green category headings. Note that you can click on the pictures to enlarge them! This summer I had the exciting opportunity to attend the International Folk-Art Market in Santa Fe, NM. The market is unique in arranging sponsorship for hundreds of exceptional artisans from dozens of countries around the globe so that they can get the exposure they would never experience at home. Attendees also had the opportunity to talk with many artisans about their work and their lives. Amongst the thousands of wonderful handcrafts there, I found myself particularly drawn to these exquisite Bandhani tie-dyed silk scarves, made by a community of about 200 traditional tie-dyers in Kutch, Gujarat, where this art has been practiced for centuries. Bandhani is the art of creating beautiful patterns on fabric by intricately tying thousands of tiny knots, then coloring, using a complex, ancient, labor-intensive dying process unique to Gujarat and Rajastan. These elegant scarves are one-of-a kind treasures, made by a socially and environmentally-responsible cottage industry awarded the Unesco Seal of Excellence for standard-setting quality and craftsmanship. A gift any woman will treasure. Mixed patterns & colors. Limited stock. The beads for peace jewelry project (part of the International Peace Initiative) provides HIV-infected and widowed mothers in Meru, Kenya, who are desperate to secure their childrens’ education and future, with economic, social and spiritual strength, independence and empowerment. They learn skills that enable them to support themselves and their children, instead of relying on their absentee husbands. 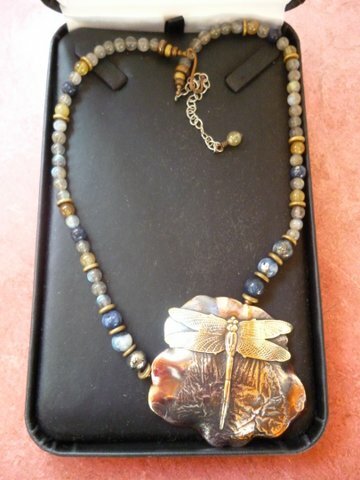 The bold and richly colorful jewelry is designed and produced by the local women, using local seeds, Kenyan Amber made in the group’s workshop, and other stones. Proceeds go directly to the women and to IPI’s programs in their community. Thank you for contributing to the lives of these women! Made from copper reclaimed from old roofing, gutters, pipes and such, these beautiful, original pins, shawl-pins and other pieces have a warm glow and beautiful patina, and feature design motifs from nature. 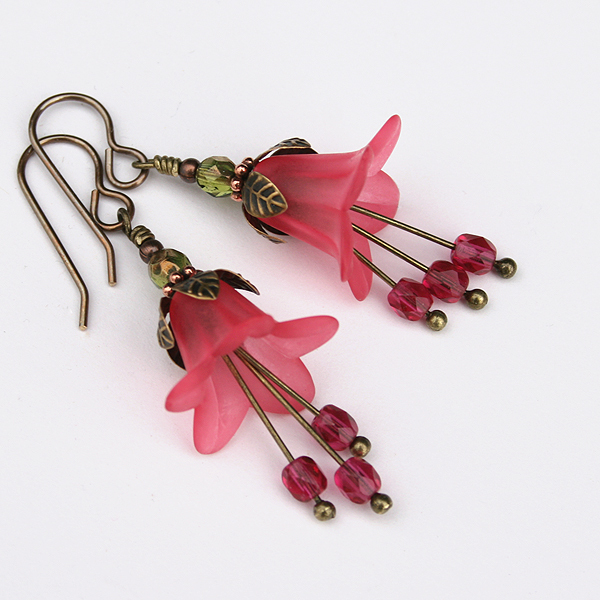 Sheron Buchele Rowland, along with her husband, makes these in their Loveland CO studio. Sheron Buchele Rowland of Fox Ryde and Ildanach Studios is quite a multi-talented artisan. In addition to her body-care products and recycled copper jewelry, she also spins and dyes (with natural plant dyes) her own yarn, knits, weaves and felts. Some of her pieces are titled ‘Gardener’s Revenge’ because she made the dyes from the weeds in her own garden – Canada Thistle, Bindweed, etc.! Using wool and silk yarns and natural dyes, she creates skeins of yarn, fingerless gloves, wrist-warmers and scarves that are luxuriously soft and lovely. Our own Engrid Winslow makes these warm and beautifully patterned soft wool slipper-socks, based on traditional Scandinavian designs and knitted using Swedish twined knitting techniques which make them thick, warm and durable so they can be worn as house slippers. They are made with 100% wool and are machine washable (cold water is best) and should be laid flat to dry. Sizes range from women’s shoe sizes 6 to 9. She is also offering ‘regular’ socks in a washable wool/poly blend in interesting colors with reinforced heels and toes. They will fit sizes women’s small to men’s medium/large. Quantities are limited – the early bird gets the socks! Cheryl also makes felted Acorn Earrings, made with real acorn caps, and dainty glass Flower Earrings. Eve can’t eat anything made with gluten. But she wasn’t about accept a life without great cookies, so she started baking these divine, rich, nut shortbread cookies, based on almond flour, pecans, and butter, subtly sweetened with a little maple syrup. Gluten-free and grain-free, but you don’t have to be gluten-sensitive to adore these rich and satisfying cookies. Our dear friend Juliette (aka Culinary Jules) is an inspired and passionate ‘seed-to-plate’ caterer and personal chef who excels at creating incredibly delicious food that fits the palates and dietary choices of her clients. 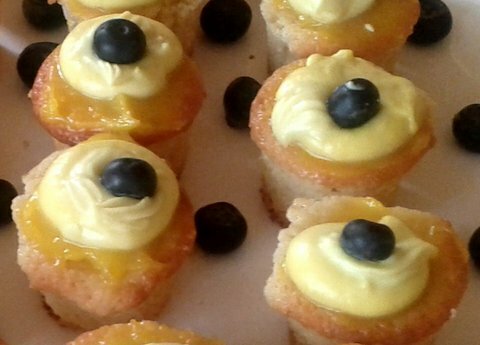 Her artistry in gluten-free baking is demonstrated in her Lemon Heaven Cupcakes, in which she has achieved perfect texture and divine flavor – rich, not too sweet, with lemon curd filling and coconut cream frosting, all made from scratch with real ingredients. They freeze beautifully, and come frozen, packaged in special gift-worthy boxes. Juliette’s Purely Decadent Truffles are made with the highest quality unsweetened chocolate, extract of Stevia (no sugar and no after-taste! ), and non-dairy milks, and are a truly decadent flavor and texture experience. They come gift-bagged in sets of six, with two each of three flavors. When not cooking and baking, Juliette and her partner Dave devote themselves to the Farmer Cultivation Center, a non-profit farm in Niwot that they founded to provide a place for training new farmers and enhancing the region’s food security for the future. Our own Engrid Winslow makes the kind of jams, jellies and chutneys that make you close your eyes and sigh with pleasure. Engrid uses fresh, organic Colorado fruit, and very little sugar, so the fruit flavors shine. She makes the classics as well as many delicious originals like Pear& Vanilla, Hand-picked Strawberry-Raspberry, and Pear & Peach Chutney, to name only a few. You’ll find delicious uses for Engrid’s preserves, from breakfast to hors d’oevres, to salad dressings, to glazes for meats, to desserts. 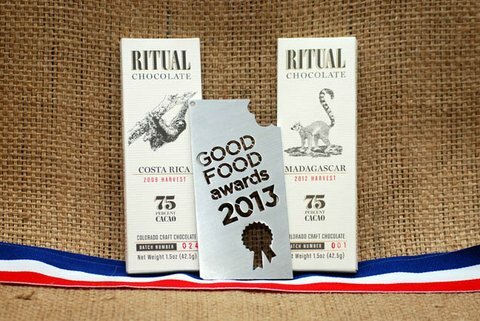 Ritual Chocolate is a quality-focused small-batch craft chocolate company based in Denver, Colorado. Their old-world, artisan approach, along with unmatched dedication to every detail of the complex process produces chocolate as delicious, distinctive and memorable as fine wine – meant to be savored. Ritual’s single-origin chocolate is made entirely under one roof using traditional, European methods with ethically-sourced cacao from around the world. Unlike most chocolate makers, who either buy their beans already roasted or even fully processed, Ritual Chocolate starts with the raw cacao beans and they hand-sort, roast, winnow, mix, refine, conche, age, temper, mold and wrap (bet you didn’t know how much goes into making a really good chocolate bar!). We offer three of their organic single-source bars: Belize, Costa Rica, and Madagascar. This is chocolate to live for! Our friends Kerry and Ben partnered to create Balsamic Nectar, a high quality balsamic vinegar reduction that would be a close cousin to Italy’s ‘Traditional Balsamic Vinegar’ which takes many years, even decades, of barrel-aging to mature to a thick, richly-flavored, sweet glaze (unlike ordinary Balsamic Vinegar), and is a treasure handed down through generations of the families in Modena who make it. They developed a reduction process that’s entirely natural yet doesn’t heat the vinegar, accelerating the aging to just a couple of months, and making it available for a fraction of the price. Balsamic Nectar is a completely natural product, produced in Boulder with only one ingredient… Balsamic Vinegar of Modena. Balsamic Nectar is a ‘magic ingredient’, giving the perfect finishing touch to cheeses, grilled meat or fish, fresh berries, even ice cream! A customer favorite at last year’s Holiday Market. Ben will be at Harlequin’s on Saturday, Dec. 7th from 1 to about 3pm to conduct a tasting. Yea! Totally organic! Made in Boulder! No corn syrup! Delicious! Packaged in pretty tins! Incredibly cheap! 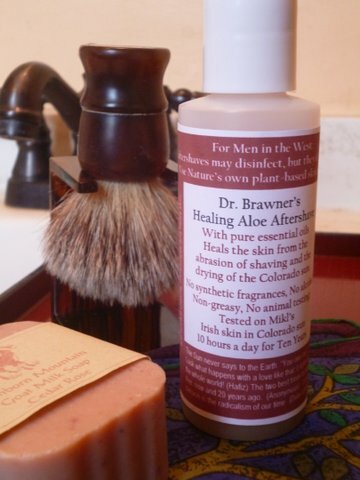 Formulated and made in Boulder by ‘the doctor’ himself (Mikl Brawner), from 99% pure Aloe Vera Gel, with cold-pressed, organic Rosehip Seed Oil; 100% pure Jojoba Oil, and 32,000 IU Vitamin E Oil, along with essential oils of Lavender, Vetiver, and Rose. That’s all. No alcohol, nothing synthetic, non-greasy. All the ingredients are natural plant products, chosen for their skin-healing qualities. The steam-distilled Rose Oil is a powerful anti-viral and antiseptic. The other ingredients are good for healing burns and dry and damaged skin, inflammation, wrinkles. They are moisturizing and uplifting to the spirits. Mikl has made and used this formula for more than 10 years to heal his Irish skin from the abrasion of shaving and the drying effects of the Colorado sun (and keep him looking youthful and handsome). And it smells wonderful! Created by Plum Botanicals, a small fair-trade organic skin-care line based here in Boulder. This long-lasting lip balm is based on wild-collected African shea butter from a women’s cooperative, and scented with the marvelous, unique, citrus-y essential oil of neroli. Shea butter is a natural sun-blocker, so it really helps prevent chapping in all seasons. Kisu is, by far, Eve’s favorite lip balm. Cool Goddess is a wonderfully refreshing spritzer from Boulder-based Plum Botanicals. It provides instant relief when temperatures soar, and is especially helpful for hot flashes, containing plant essences known for balancing hormones, as well as cooling and calming. Sandalwood mist is another great cooling and refreshing spritzer made with the finest essence of Sandalwood – woodsy, spicy, exotic! The Spanish word ‘trementina’ has come to be used as the name for the sap of the pinyon tree ofNew Mexico. Folk remedies made from this sap have been used for centuries to relieve dry, cracked skin, abrasions and scrapes, and for drawing out splinters. Made in New Mexico’s ‘curandera’ tradition by our friend Pamela, who climbed the pinyon trees to gather the sap, and infused it in olive oil and New Mexico beeswax to create this rare traditional salve. Each tin of salve comes in a lovely organza gift bag. Our friends Carol and Jim Schott, who you may remember as founder of Haystack Mountain Goat Dairy of Niwot, CO, have resettled over on the Western Slope and created Lamborn Mountain Farmstead on Lamborn Mesa, overlooking Paonia, CO in the North Fork Valley, an area known for its organic orchards, vegetables farms, and vineyards; Carol and Jim are helping to add lavender to that list. From the milk of their own goats and lavender from their fields, they make the most luxuriously creamy, moisturizing hand and body lotion and gentle aromatic soaps. We also offer their Rose soap (our favorite rose-scented soap) and their Culinary Lavender – lavender buds harvested at their peak from varieties especially valued for use in cooking (some recipes included!) and tea. 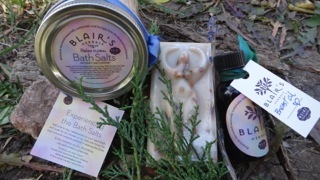 We are pleased to offer our friend Blair’s line of handmade, reiki-infused, self-care products that bring forth the healing properties of the biodynamically-grown plants she raises in her organic Boulder garden. We carry her long-lasting, moisturizing Goddess Soaps (all natural glycerin infused with nourishing herbs and a magical touch of mica), relaxing and healing mineral-rich Bath Salts, and nourishing Breast Oil. Mikl and Eve have been using ‘Mountain Mist’ lavender hand & body lotion from Colorado Aromatics for a long time. The quality of the lavender scent is exceptional, and the lotion is so soothing and moisturizing to dry, abused gardeners’ skin. We offer individual products, and gift sets in lovely mesh bags. Also from Colorado Aromatics : Knuckle Balm, Hand Spa sets and Foot Spa sets, made in Longmont CO with the finest natural ingredients. Top-rated. Zinc oxide UV protection; no titanium dioxide, non-nano, no fragrances; good moisturizer, ideal for sensitive skin; does not sting eyes; very effective and Now Less Expensive. The only sunscreen Mikl will use. affordable, and similar designs are available as small indoor wall-pieces and as pendants on necklaces. All make great gifts! The art doesn’t stop there – their daughter Avery has enjoyed exploring the beautiful art of origami – her carefully crafted paper flowers use a vibrant combination of printed and solid colored papers, complemented by hand-painted leaves and stamens, and make a delightful, original and long-lasting bouquet that will brighten up any room. 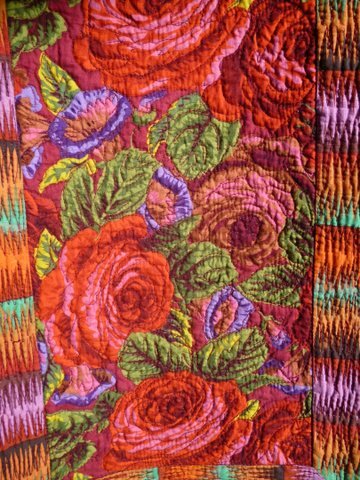 Our dear friend Lynn Mattingly is a renowned fiber artist, and has been practicing and teaching quilting for decades. An exceptional sense of color-combining, a fabulous collection of fabrics and a mastery of design and craftsmanship combine to make Lynn’s work really special. We love seeing her beautiful pot-holders hanging on our stove, and they have held up in our kitchen for a very long time. Lynn lives just over the hills in Paonia. Our friend Lynn also makes these artful painted fabric garlands or ‘prayer flags’ with the always-appropriate message of Peace. Drape them on your holiday tree, across the top of a doorway or window, or any place where you’ll enjoy their beauty and soothing sentiment. 3” high.on silk ribbon approx. 48” long. wrapping or cover for storing foods. Using gentle pressure and the warmth of your hands, shape the flat square to tightly cover a bowl of leftovers, wrap up cheese, form around produce, baked goods, etc. 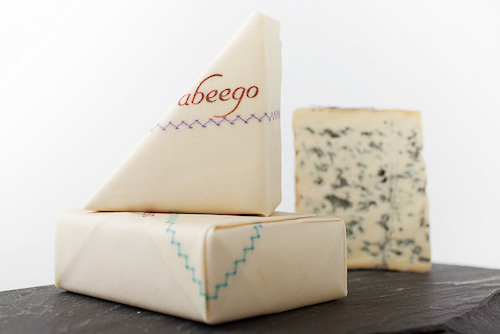 Abeego is malleable and slightly adhesive at room temperature and will stiffen when cool, holding the shape you created. The beeswax coating is fluid-resistant, keeps food fresh longer than plastic, and is easy to clean. With proper care, you can expect Abeego to last over a year. Each 3-pack contains a 7”, 10”, and a 13” sheet. Made in Canada. 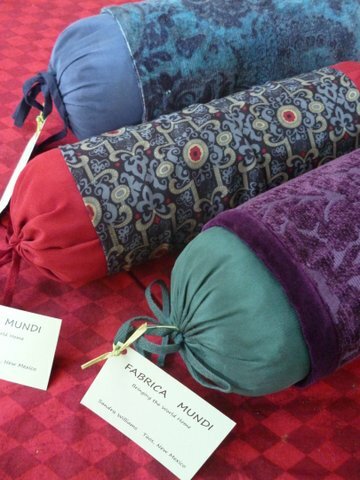 From the fiber and paper studio of our friend Sandra Williams in Taos NM, Fabrica Mundi tea cozies, oven mitts and neck roll pillows (filled with buckwheat husks), are made of rich toned cotton and silk fabrics from around the world. They bring an ethnic touch to your home. 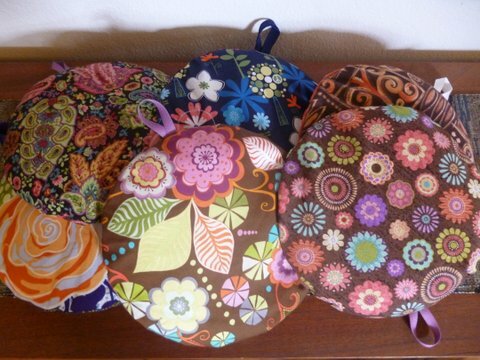 Keep your teapot piping hot and relax with a supportive neck roll pillow. For decades, our friend Tom Theobold of Niwot Honey Farm has been nurturing bees, harvesting honey, and crafting the finest, most elegant, romantic, hand-dipped taper candles you’ll find anywhere. They are naturally dripless and smokeless, and infuse the room with the gentle, warm fragrance of honey. They are a perfect fit in any décor, from Shaker to Rococco. Available in pairs, either clear-wrapped or gift boxed. Our friends Thea and Lele are well known around Boulder and beyond for their charming tradition-based Italian majolica pottery. We asked them to design and create some small candleholders with a bee motif, to fit the beautiful Niwot Honey Farm beeswax taper candles we carry. They make a delightful gift for almost anyone (especially paired with the beeswax tapers). Our friend Clark and his grand-daughter spend quality time together making delightful cast beeswax candles in a variety of shapes and sizes in their Longmont studio. Their delightful array includes simple pillars (several sizes), patterned pillars, pine cones, honey-bears, angels, bee-hives, gnomes, turtles, dragons, and a brand-new line of wonderfully detailed traditional European holiday-season candles. They are highly decorative, naturally endowed with a heavenly honey scent, and burn clean and smokeless. 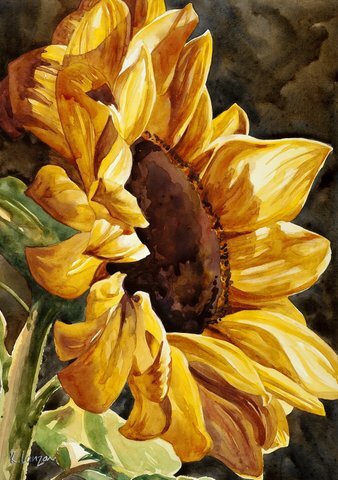 Notecards of vibrant paintings by Boulder watercolor artist and muralist Kathleen Lanzoni feature floral and local landscape subjects. This year Kathleen will also offer some of her original paintings and prints. Our friend Fred is a dedicated ‘rock hound’, with a special passion for meteorites and petrified wood. His expeditions in Utah have yielded some wonderful specimens from the Jurassic era, including segments of small branches in which the exterior bark texture has been preserved, and the interiors have been replaced with vividly multicolored agate. Fred has polished the top surface of each specimen to reveal the beauty of the agate. Each piece comes with an identification tag and a text explaining the process by which petrified wood was formed. Sizes will probably range from 1” to 5” in height, varying widths. Fred will be on hand at our market to talk about petrified wood on Friday Dec. 6th 2 – 3:30pm. Made with reverence, skill and healing intention by our friend Furry Foote, the elder who lives in the foothills, these traditional Native American smudge sticks are finely crafted of aromatic herbs (mostly natives) grown in her own organic garden. Each herb is included for its specific medicinal and/or spiritual qualities: purifying, giving thanks, cleansing, infection-fighting, head-ache relief, etc. Eve began painting small plein-air watercolors when she and Mikl made the decision to take their honeymoon in Italy. She wanted to spend some time really looking at the landscape there and bring home more than snapshot photos, and she had a year to get good at painting fast and small before the trip. At the end of the vacation she had 12 good paintings, and when she got home she just kept painting, focusing on landscapes closer to home. These originals are all small and affordable; most are museum matted, a few are framed. 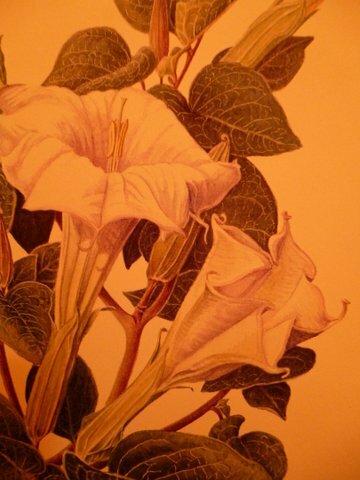 Eve Reshetnik Brawner is an award-winning botanical artist whose work has been exhibited around the US and abroad, and is represented in the permanent collection of the prestigious Hunt Institute of Botanical Documentation. 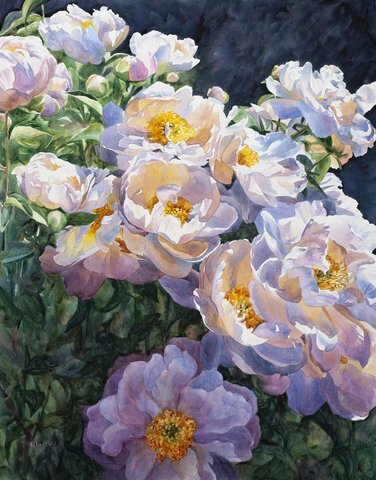 All of Eve’s paintings are executed in watercolor, a challenging but preferred medium for capturing the silky and vibrant translucency of flowers. In her paintings she has tried to combine minutely accurate scientific detail with the grace and character of each subject. Matted and un-matted prints are available, as well as a few framed original paintings. 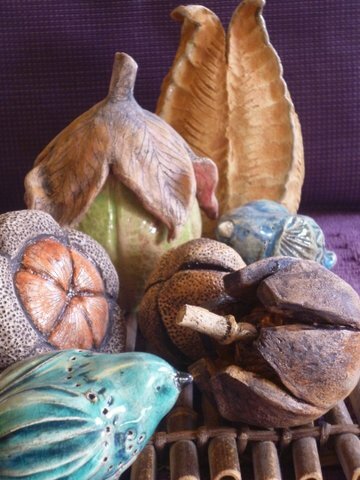 In the past few years Eve has turned her talents to the playful medium of clay, and has managed to produce some planters, bird totems, pods, and miscellaneous other pieces to offer at our Holiday Gift Market. Children have a lively interest in the natural world. They love vivid pictures, but they are bored if we dumb it down for them. These children’s books are fascinating even for adults, full of in-depth science, but graphic and fun—many with projects and activities that make facts real. Geology of the Desert Southwest, Geology of the Great Plains and Mountain West, Discover the Desert, Discover the Oceans, Discover National Monuments & Natural Wonders. And two other books, Amphibians and Eye See You have luscious and dramatic color photographs. 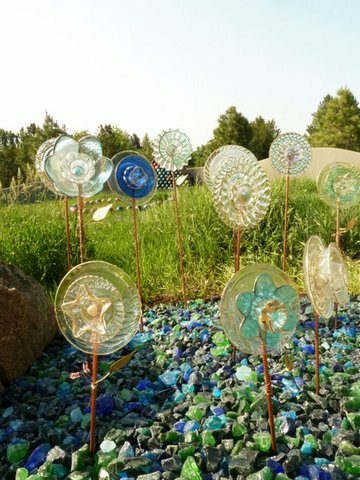 Shelley Goddard’s ‘Crystal Blossom’ glass garden flowers are created from glassware adopted from local thrift stores. In her home studio, which is a veritable Mosh Pit of creativity, Shelley cleans, drills, gilds and assembles the various pieces-turning them into continuously blooming garden sculptures, mounted on sturdy metal ‘stems’. They can be used to decorate the garden year-round, and look great in snow! Shelley has lived in Boulder, CO for over 45 years, founded the Boulder Arts & Crafts Co-op, and As You Wish, the vanguard store for the “Paint Your Own” pottery movement. 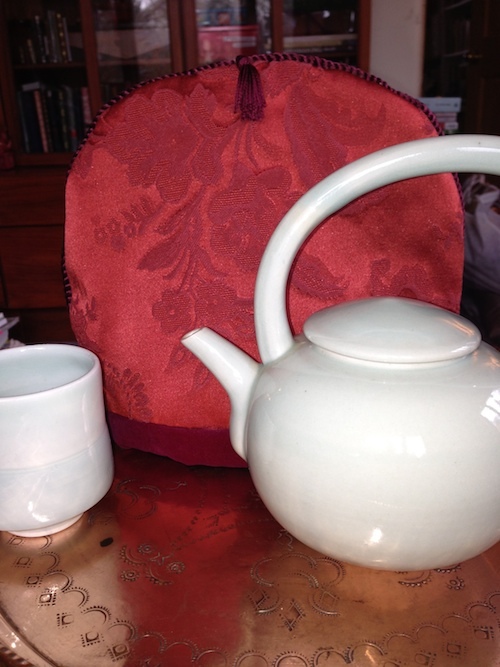 Originally (and still) a potter, she has been involved in many creative local business ventures and delights in teaching. The Stella Natura Wall Calendar is an easy-to-use, informative and beautiful planting and gardening calendar that shows the best times to take advantage of the cosmic influences of the moon, sun and planets. This is a research-based system that is used by Biodynamic farmers and gardeners. 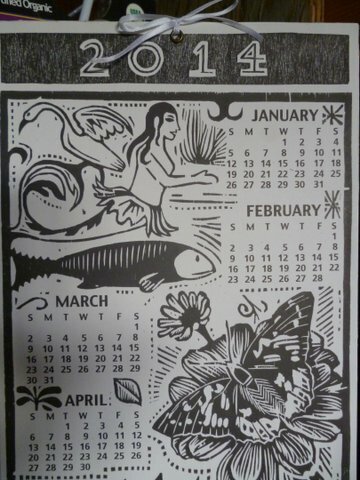 We have been using this calendar for 22 years and believe it has helped with germination of seeds, root development of cuttings, and healthy plant development. More than just a calendar – it’s packed with valuable information and insights for successful growing, from seed to harvest. 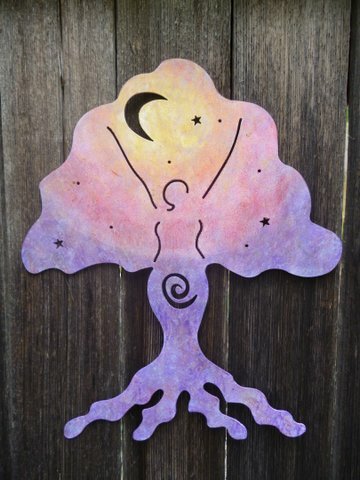 Mikl will be giving a class in Planting by the Moon in March 2014, which will help you better understand and get the most out of your astrological planting calendar. This very small, extremely high quality 12x power magnifier is great for getting a closer look at what’s bugging your plants, taking out splinters, or helping to identify flowers. BBB is a great local seed company, offering wildflower mixes (Rocky Mt. natives), and flower seed mixes for supporting honey bees and wild bees. We have their Honey Source, Bee Rescue and Rocky Mountain Wildflower seed mixes, perfect for gifts or holiday party favors. Winter is the season when most gardeners get to read gardening books to help them plan and dream their next gardening season. For the most accurate gardening advice for your Colorado garden, look to our local garden writers! The new ‘Organic Gardener’s Companion’ by Jane Shellenberger, editor & publisher of the Colorado Gardener magazine, offers up-to-date Colorado-specific advice on every aspect of organic vegetable gardening. We also have recent books from Colorado’s ‘garden-laureates’ Lauren Springer Ogden & Scott Ogden, including the new revised ‘Undaunted Garden’. If you live outside the metro area and would like us to mail this book to you or a friend, please contact us by phone for details. We love West Count gloves! They are made from recycled plastic bottles, are very durable and stand-up to several seasons of tough gardening. They are machine washable and retain their shape. And they come in great colors! We carry their Work Glove, Landscaper Glove, Waterproof Glove, Rose Gauntlet, Mud Glove and Grip Glove, all in a range of sizes. If you give these gloves as a gift, be assured that the recipient is welcome to exchange them for a different in-stock size, as long as they are still unused and in their original packaging. These beautiful glazed stoneware garlic-keepers, hand-crafted by Boulder potter Cathy Abelson, have perforations to keep garlic fresh as long as possible on the kitchen counter or in your pantry. They are big enough to keep up to a pound of garlic at your fingertips. Cathy’s work is sold in fine galleries around the nation. Reviewed by our Deb: This is the best all around tool ever! Whenever I go out into the garden with no particular task in mind (other than peace of mind putzing) I grab this tool. It can dig, saw into fat roots, slice into bindweed roots with the pointed tip, it’s wonderful. I have a sheath for it which slides nicely onto a regular belt or garden-tool belt. I love using if for planting bulbs as I can make a deep, small hole. If I could only have one tool forever…I would choose this one. Harlequin’s Gardens Gift Certificates are always a perfect gift for any Front Range gardener (okay, maybe not perfect for someone who only grows a water garden) and are always available. Come in to buy gift certificates and shop our Holiday Market, or follow the instructions on our website to order by phone or mail. If you need a gift certificate during the months when we are closed (November, January, February) you are welcome to order it by mail or phone. 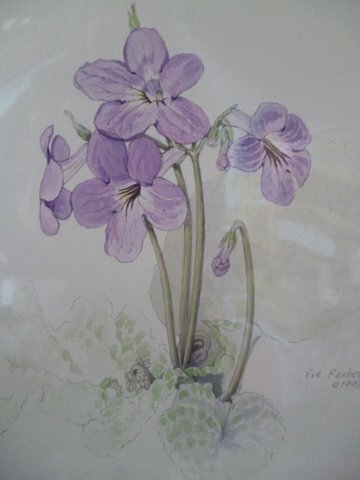 See Gift Certificates at www.harlequinsgardens.com. Our favorite local farmer/writer/activist Kayann Short, Ph.D., has written a marvelous and widely acclaimed memoir, A Bushel’s Worth: An Ecobiography. Kayann will be here at Harlequin’s Gardens to sign her book on Saturday, December 7, from 1:30 to 4:00 PM. You will love these recordings made by some of the performers playing at our Holiday Open House this year! At 27 years old, The Boulder Irish Session is a Boulder ‘institution’ and is still going strong. They are an informal, dynamic gathering of top-notch Front Range musicians who come together on Sunday evenings at Conor O’Neil’s Pub in downtown Boulder to share tunes and songs of the Celtic tradition. Over the years, the Session has gained many loyal followers who know they will always hear some of the best, most spirited live traditional Irish and Celtic music in the region on any given Sunday, comparable to sessions in Galway and County Clare. Harlequin’s Gardens co-owner Eve Brawner is one of the founding members of the Boulder Irish Session and is still a ‘regular’ there, playing English concertina, and singing. About six years ago, the Session produced this vibrant, live-in-the-studio CD, comprised of 15 tracks, presenting 33 of our favorite tunes and songs, played by an ensemble of Session members on fiddle, flute, banjo, concertina, button accordion, tin whistle, octave mandolin (bouzouki), guitar, bodhran and vocals. Mason Brown is a singer-songwriter and guitarist exploring the space where traditions and creative expression intersect. Mason’s fine voice, guitar, banjo, and viola da gamba can be heard in concerts around the region and in Irish Sessions in Boulder. His most recent solo album, When Humans Walked the Earth includes traditional and original songs and tunes, and performances with such noted artists as Randal Bays, Katäri Brown, Connie Dover, Mark Dudrow, Peter Halter, and Roger Landes. Mason is also a player in the Boulder Irish Session, a Zen Buddhist priest, and a student of ethnomusicology. Come and hear Mason play at our Holiday Open House on Friday, November 29 from 11:30am to 1:30pm. Margot is one of the region’s finest and most versatile harpists. Her fresh, innovative approach, passion and virtuosity have won her numerous awards. Her most recent CDs, Icy December and White Birds both feature Margot on harp and Beth Gadbaw’s exquisite vocals. They are superbly arranged collections of songs rooted in the Celtic tradition. Icy December offers a fresh selection of winter holiday songs, including Celtic and original songs. This is “music that touches the heart”. The Boulder Irish Session is often graced with Margot’s harp-playing on Sunday nights at Conor O’Neil’s. Margot teaches harp at her Boulder studio, and you can hear her perform at our Holiday Open House on Sunday, December 1st, from 1:00 pm to 2:30 pm. Jon is one of the rising stars of Traditional Irish music and solo finger-style guitar, and has studied and performed to much acclaim in Ireland and Europe as well as Colorado. Jon’s musical journey started early in his life, including rock and electronic dance music, but after moving to Boulder in 2003, he fell deeply in love with Traditional Irish music. Jon plays both guitar and banjo. His impeccable technique and the grace and passion of his playing are dazzling. Jon teaches and performs as a duo with the equally talented Adam Agee on fiddle, and can sometimes be found at the Boulder Irish Session at Conor O’Neil’s. Jon will play for us at our Holiday Open House on Saturday November 30th from 11:00am to 1:00pm. This coupon book makes a great gift (and do keep one for yourself!). Focusing on the Denver Metro and Boulder areas, it’s full of hundreds of discount coupons for environmentally conscious, organic, healthy and fair-trade products, stores, eateries and services you will really use, such as Boulder County and Denver Farmer’s Markets, Natural Grocers, McGuckin, Ace Hardware, Harlequin’s Gardens, Butterfly Pavillion, Colorado Music Festival, RTD, and so many more. All kinds of organic foods and personal care products, pet foods and services, stuff for kids and moms, gluten-free foods, classes, sporting goods, espresso, chocolate, pizza, granola bars, etc. Both the paper coupon book and the mobile app are available. Trust me – you or the lucky recipient will easily make back the cost of the book many times over. Thank you so much for your support! We wish you a season of happiness and fulfillment, and we look forward to seeing you soon at our Holiday Gift Market. We had a beautiful Holiday Open House weekend, and a great response to the opening of our Holiday Gift Market. Your support means so much to us and to the local artisans whose exceptional work we are featuring in our market. We enjoyed visiting with our gardening friends and customers who came out to shop, visit, and enjoy the beautiful live music and home-made refreshments. By the way, we are carrying CD recordings by several of the musicians who played for our Open House. Several products sold out very quickly, but have no fear – we have deliveries and shipments on the way to restock them. Meet the Rock Hounds, Fred Hall and Kelly Manley, to explore the fascinating natural history of Petrified Wood and examine their intricate beauty. Balsamic Nectar sampling with Ben Powell – Taste this unique gourmet treat and discover the many ways it can elevate a dish from ordinary to exceptional. See the description and details about A Bushel’s Worth below. Meet Sheron Buchele Rowland of Fox Ryde. 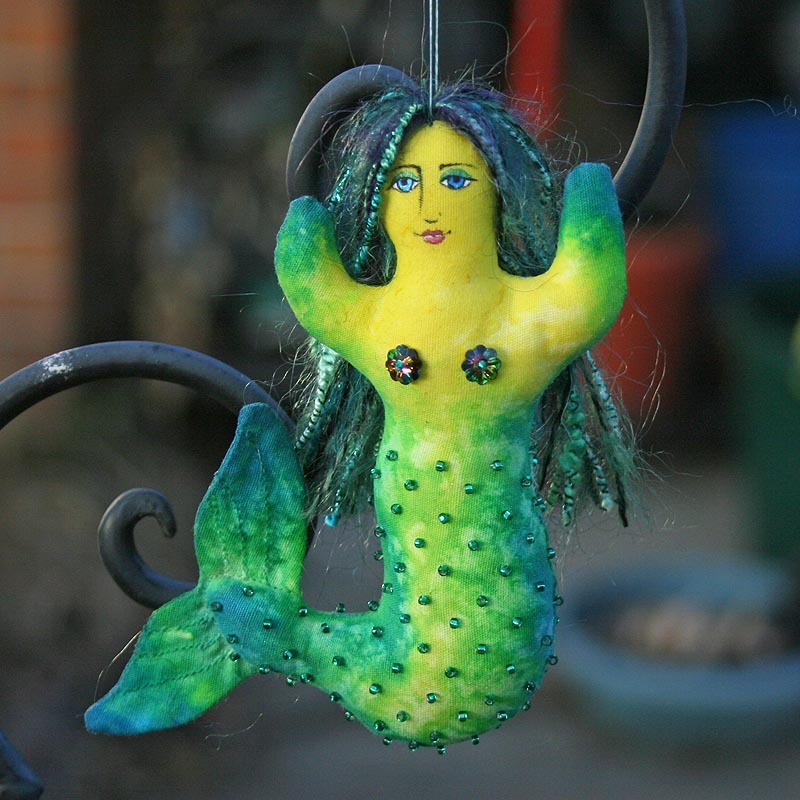 In her Loveland studio, herbalist and artist Sheron creates a wide range of natural products and crafts. We carry her line of fine herbal body-care products, beautiful silk scarves and knitted accessories dyed by hand with natural dyes derived from the plants she grows in her garden, and striking lapel-pins made from recycled copper. See the description and details about the book below. Mark Andreas, a Life-Coach in Boulder, collected these 61 true stories of creative and compassionate ways out of conflict. Each story is unique in the resourceful and often surprising solutions that real people have found to change a fearful or threatening encounter into a humanizing connection. Not moralistic, and genuinely eye-opening, heart-opening and inspiring. It makes a wonderful gift that can be opened again and again. Sweet Fruit from the Bitter Tree is strongly endorsed by Dan Millman (author of Way of the Peaceful Warrior), William Ury (author of Getting to Yes), and Eve & Mikl Brawner. Meet the author and have him sign your copies of the book on Sunday, December 15th between 11:00 am and 2:00 pm. Delightfully whimsical and lovable animals and figures in clay from artist Ann Kistner of Lafayette, CO. Ann is a studio-mate of Eve’s in the Longmont Clay Collective at Katy Diver’s inspiring studio. She has a special gift for capturing the gesture and character of her subjects. 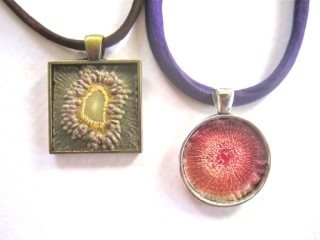 In her Denver studio, Adrienne deLoe fashions these lovely pendants, each one a celebration of the flowers and foliage from her garden, some vivid, some subtle and demure, all very attractive and affordable. Paula Slick is an artist talented in many mediums. She lives in Louisville, where she is a graphic designer and a designer of seasonal events. Most of all, she loves gardening and all things natural. 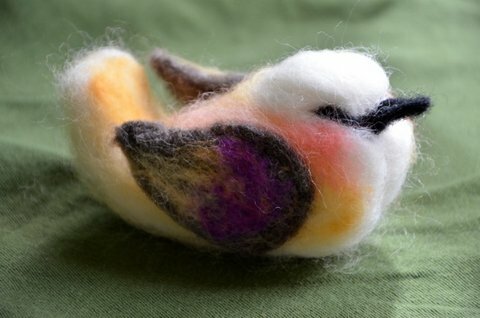 These days she is working in fiber, creating needle felted creatures from natural wool fiber. The little birds and other creatures are perfect for the windowsill, the Christmas tree, next to an arrangement of flowers or to place in the hand of a friend. They are non toxic but not intended for very young children. Each one is very one-of-a-kind so people love to hold one after another to see which speaks to them. Made by hand for your hands. Boulder clay artist Mary Lynn Schumacher makes almost mythical forms and figures that evoke stories, full of mystery and delight, intrigue and imagination. For the past 25 years, she has made functional pieces and sculptural objects in clay, combining patterns and forms of the natural world with influences of art and architecture from around the world and throughout time. We have some of Mary Lynn’s wall niches, which can be used in the home or garden as small personal shrines, a place to perch a votive candle, a flower or other ‘offering’, and other wall-mounted ornaments, as well as unique planters and holiday tree ornaments. A fusion of whimsy, gesture, pattern, texture and patina characterizes Willi Eggerman’s works in clay, which she conceives as functional sculpture – useful pieces with enough presence to stand alone as objects of aesthetic interest for contemplation. To make her organic, botanically inspired porcelain pieces, she employs a wide variety of techniques. A long-time member of the Boulder Potter’s Guild, Willi’s work is admired and acclaimed throughout the region. We are offering some of Willi’s Ikebana ‘pods’, perfect for small, informal floral specimens or mini-bouquets, and her fanciful pods that can mount on garden stakes or hang on the wall. Boulder is fortunate that Theresa Haberkorn, woodcut printmaker, has made Boulder her home for two decades. Her masterful woodcut prints are found in exhibits and collections nation-wide, and she teaches her artform as well. 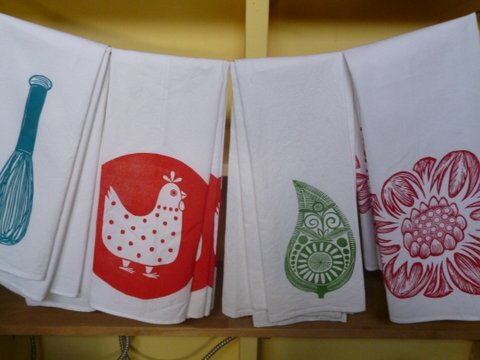 Theresa brings her art to household items as well, hand-crafting a collection of beautiful block-printed cotton tea towels, a charming wall calendar, and greeting cards. Lemon Heaven Gluten-free Cupcakes with lemon curd filling and lemon coconut cream icing, from Boulder’s Culinary Jules. Made from scratch with delicious real ingredients. They come frozen, 4 per special cupcake box, and can stay frozen until needed. Purely Decadent Chocolate Truffles from Culinary Jules. Hand-made from scratch with the finest real ingredients, incredibly rich and delicious, yet SUGAR-FREE – they are sweetened with natural extract of Stevia leaf, which has a zero glycemic index rating. Three flavors (Orange, Hazelnut and Peppermint) are packaged 6 per gift-bag (2 of each flavor). Balsamic Nectar from Boulder Flavors – not your everyday Balsamic vinegar! Rich, sweet and thick, a remarkably versatile ‘secret ingredient’ to provide a finishing touch that makes almost any dish exceptional. Ritual Chocolate – Hand-made small-batch artisan chocolate made in Denver. One of the very finest chocolate we have ever tasted (and we are chocolate aficionados). These single-source chocolates have exceptionally rich and complex flavors, worthy of savoring like fine wine. Madagascar, Belize, Costa Rica, and brand-new Nibs bars. Eve’s Pecan Shortbread – gluten-free, grain-free, hand-made with simple organic, natural ingredients – nuts, nut flour, maple syrup, butter. And love. Rich and delicious, and not too sweet. We look forward to seeing you at our Holiday Gift Market on one of our weekends (Friday through Sunday). In the meantime, stay warm and open-hearted.